The “Diary” is one of the gems of mystical literature. Saint Faustina Kowalska wrote it in Vilnius and Cracow in 1934 – 1938 as Jesus had commanded her to do so directly. Her confessors, Rev. Michael Sopoćko and Father Joseph Andrasz S.J. had also ordered her to write it and the superiors of the Congregation had given her their consent. The earliest notes that have remained were written in July 1934. It is known that Sister Faustina burnt the first ones because when Rev. Michael Sopoćko was not in Vilnius she yielded in to the per- suasion of an alleged angel who was Satan. Later the spiritual director from Vilnius ordered her to reconstruct what had been destroyed. Therefore, the chronology in the present “Diary” is distorted, especially in the first notebook: the author intersperses current events and experiences with the description of those that happened before. Sister Faustina wrote all the notes in secret when she did not carry out her monastic duties. She also wrote them in hospital, where she had more time and, at Rev. Michael Sopocko’s request, she underlined all Jesus’ words with a pencil. Although I am feeling weak and my nature is clamouring for rest, she admitted honestly, I feel the inspiration of grace telling me to take hold of myself and write, write for the comfort of souls, whom I love so much and with whom I will share all eternity. And I desire eternal life for them so ardently that that is why I use all my free moments, no matter how short, for writing in the way that Jesus wishes of me (Diary 1471). The last notes were taken in June 1938, so Sister Faustina ceased writing the “Diary” three months before her death. She wrote six notebooks altogether, which were published along with a small notebook entitled: “My preparation for Holy Communion”. In the “Diary” Sister Faustina described her spiritual life, which was especially deep, reaching the summit of union with God in the mystical betrothal. She depicted how deeply she came to know the mystery of the Divine Mercy and how she contemplated it in her daily life. She also wrote about the struggle against the weaknesses of human nature and difficulties pertaining to the prophetic mission. Above all, the “Diary” contains the message of God’s merciful love for man, which Sister Faustina was to pass on to the Church and the world. Therefore, this is a special work, as Holy Father John Paul II said, “the gospel of mercy written from the perspective of the 20th century”. The manuscript of the “Diary” consists of six notebooks of different length. Altogether there are 477 leaves and both pages of each leaf have been heavily written on. 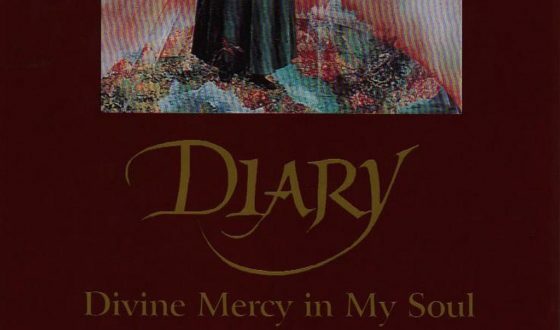 At the beginning of every notebook, apart from the fourth one, Sister Faustina wrote her religious name and a sentence about the Divine Mercy, for example “Divine Mercy in my Soul” or “The Mercy of the Lord I will Sing Forever”. There are no amendments or crossings-out in the manuscript. Even when the author left out a letter, repeated a word or made a spelling mistake, she did not correct anything. At Rev. Sopoćko’s demand she marked only Jesus’ words, underlining them with a pencil. In the original notebooks there are a few blank pages. Most probably the author did not use them in order to finish writing something on them later on, however, they have remained blank. She did not number the pages in her manuscript either. For practical reasons Father Joseph Andrasz and Sister Ksawera Olszamowska O.L.M., paginated the manuscript with a pencil after the author’s death. The manuscript is in a very good condition, there is no damage. Actually, it is missing only one leaf. It is not known who tore it out, which has been noted down in the published book. The work reveals the richness and fascinating beauty of the mystery of the Divine mercy shown from the angle of the author’s life and mystical experiences. It depicts the spiritual way she walked along, reaching the close union with God. The work also shows the message of mercy, which God passed on to the Church and the world through her. In the “Diary” Sister Faustina depicts her meetings with God, the unusual contact with the supernatural world: meetings with Jesus, Our Lady, angels, saints, souls suffering in purgatory, attacks of the Evil Spirit. She writes how she struggled every day, how she worked in order to become better, how she made efforts to trust God and love her neighbours actively – to the extent of making an offering of her life. The great prophetic mission became part of her life – she was to remind the world about the truth about God’s merciful love for each man and to preach it with a new strength. In the “Diary” there is a full description of the message of mercy as well as the efforts that Sister Faustina, her confessors and superiors made to carry out the prophetic mission. When Sister Faustina wrote the “Diary” she took into consideration the possibility of having it published “for the consolation of souls”, however, she wanted it to be done after her death. Therefore, she attached the following note to her work: Jesus. Nobody can read the notebooks and notes – Father Andrasz or Rev. Sopoćko must check them first because the notes contain the secrets of my conscience. It is God’s will so that all of that is given to souls for their consolation. Apart from the superiors, the sisters should not be allowed to read the notes until they have been published. Cracow, retreat, 3 April 1938, Sister Faustina. After Sister Faustina’s death her notes remained in the congregation. According to the author’s will they were guarded well and only the superiors (general superior and superior of the house in Cracow) and her confessors had access to them. By order of Mother General, Michaela Moraczewska, the notebooks were rewritten, however, unfortunately, it was done imprecisely and unscientifically. There were many mistakes in the private typescripts; a lot of words were left out, misinterpreted or miscorrected. What also made rewriting the text difficult was the style of the author, who in the same sentence frequently wrote her own words and then quoted the ones of Jesus, which she marked with a pencil in the manuscript but in the typescripts it was not done so. That is why the sentences were not only incomprehensible but also smacked of heresy. For example, on page 161 of the manuscript it is written: God has promised a great grace especially to you and all those – who will proclaim My great mercy. If Jesus’ words had not been marked (in bold type), the sentence would be at least unclear. It may also be understood in such a way that God has promised a great grace to those that will proclaim the author’s great mercy. Of course, this is a heresy. The faulty typescript of the “Diary” was even translated into Italian and the translation was one of the reasons why in 1959 the Holy See gave a notification banning the spread of the Divine Mercy worship in the forms conveyed by Sister Faustina. 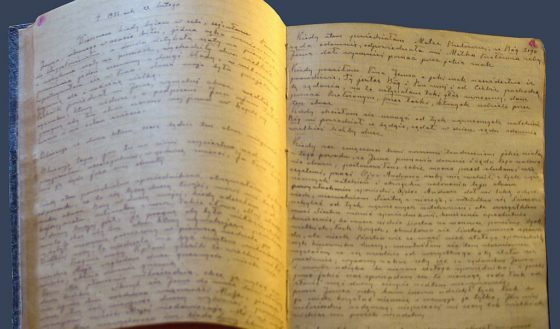 The manuscript of the “Diary” was rewritten for the second time as it was needed for the Informative Process relating the beatification of Sister Faustina. Not only was the text rewritten from the original but it was also carefully collated by Father Isidore Borkiewicz OFM Conv and Sister Beata Piekut O.L.M. during the Informative Process and became the source of the translation into French. The above-mentioned translation, along with the typescript certified by the Metropolitan Curia in Cracow (19 October 1967) as well as the photocopies of the manuscript, was attached to the Act of the Informative Process and sent to Rome. 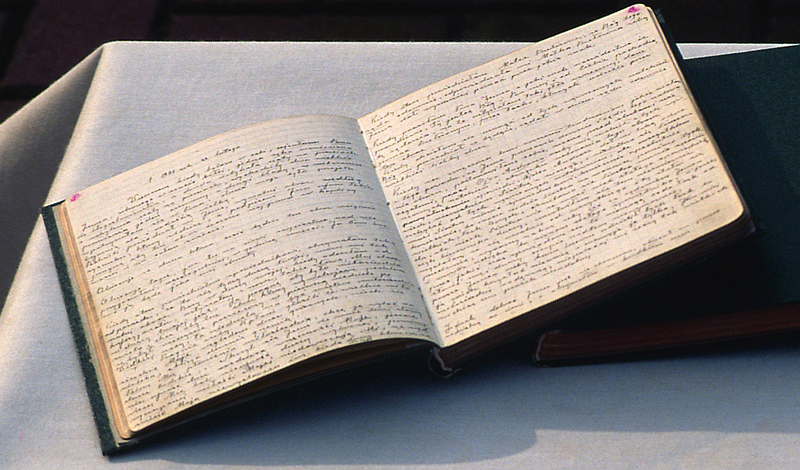 This copy of the “Diary”, along with its footnotes and indices prepared under the direction of the Vice-promoter of the Faith, Father George Mrówczyński, and Sister Beata Piekut O.L.M., was sent to Rome to the Postulator-General of the beatification process, Father Anthony Mruk S.J., so that it was possible to publish the work under his direction. For the first time the “Diary” was published in Polish in Rome in 1981, then in Poland. This edition has been the source text of all the translations into other languages. Even if a translation of the “Diary” is the source text of another translation, the text is always checked and compared with the edition in the source language. The “Diary” is one of the most widely-read religious works. A large number of its copies have been sold. It has been very popular because, as Jesus said, it was written for the consolation and encouragement of souls. By reading the work many people come to know God’s merciful love more, finds ways to come back to Him or grow in love.